BioShock 2 ended New Super Mario Bros. Wii's two-month hold atop the U.S. console sales charts, edging the Nintendo platformer by 7,000 units to take February's top honors. 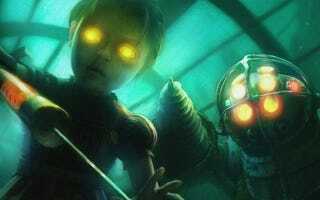 Both sold more than 500,000 copies - BioShock 2's 562,900 to New Super Mario Bros. Wii's 555,600. Call of Duty: Modern Warfare 2 came in third with its 360 version. Combined with its PS3 sales the game moved 567,100 copies. Somewhat of a surprise, Dante's Inferno triumphed over a mixed-bag of reviews to capture the eighth and ninth positions, selling more than 460,000 copies overall. Console exclusives Mass Effect 2 and Heavy Rain returned respectable performances at seventh and 10th place, respectively, with Mass Effect having a one-month head start. Here are February's top ten games in the U.S., according to the NPD group. U.S. consumers dropped $624.4 million on video games during the month of February, down 18 percent from February 2009, when software sales reached $736.7 million.